Michele Moore Veldhoen read from her book The View From Right Field on Thursday at Fort Macleod Library. 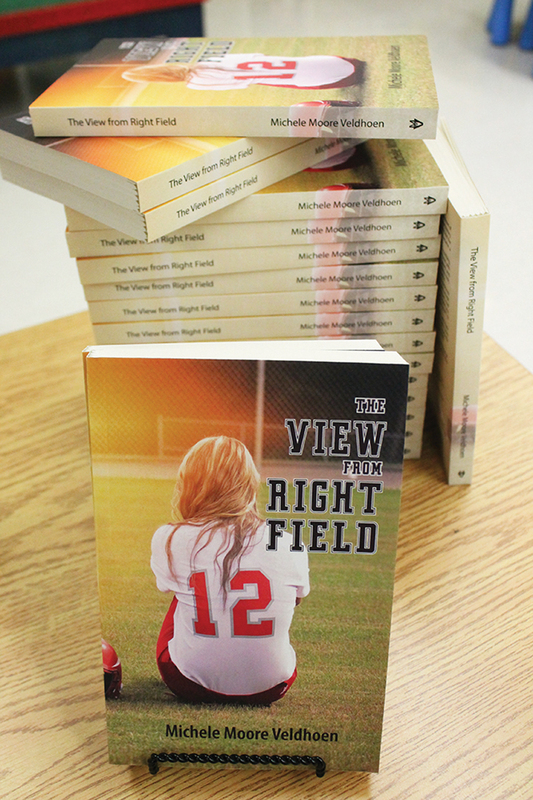 The View From Right Field is the first book published by Michele Moore Veldhoen. 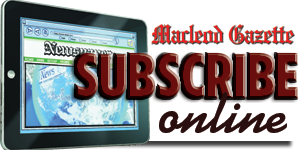 Michele Moore Veldhoen knew early in her life that she wanted to be a writer. It just took her longer than expected to publish her first book as life took her in unexpected directions. And it took returning to another childhood love — softball — for the Okotoks area resident to find inspiration for her first book, The View From Right Field. 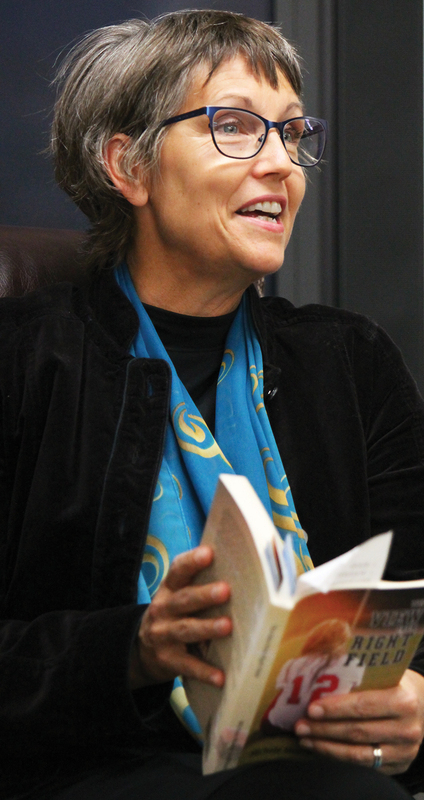 Moore Veldhoen was guest speaker last month at Fort Macleod Library, where she shared her journey to becoming a published author with about a dozen people. Moore Veldhoen kept a diary and wrote short stories and poems in her youth, always believing she would be a writer. Her world was turned upside-down when she was 12 years old and her family moved to the Yukon from Christina Lake, B.C. for a business opportunity. Moore Veldhoen found herself living in a disfunctional community where substance abuse and violence were everyday realities. Moore Veldhoen made friends with other young people in the community and went into survival mode with them. Sixteen months later, Moore Veldhoen suffered another culture shock when he mother became ill and the family suddenly moved away. She left behind her close friend Pearl. “I felt tremendous loss and what I understood later was guilt about leaving my friend Pearl,” Moore Veldhoen said. Moore Veldhoen graduated high school and got married at age 20, having her first child a year later. Moore Veldhoen and her husband bought an acreage and started a construction company. She another child and her life was full as a wife, mother and business partner. Moore Veldhoen thought life was great but that winter she suffered from low energy and a desire to sleep all the time. When spring arrived she went to see a doctor, who diagnosed her with mild depression and urged her to get out and do something just for herself. Moore Veldhoen took that advice and joined the Okotoks Rainbows ladies’ slowpitch team, returning to a sport she loved as a child. The Rainbows, who played together for two decades, dominated their league and played in tournaments across Canada. Moore Veldhoen spent 16 years surrounded by what she called independent, irreverent and confident women who didn’t feel they had to apologize for anything they were doing, including being working moms. Moore Veldhoen realized she didn’t have to spend all her time focused on her family. In The View From Right Field, Moore Veldhoen uses anecdotes from her time with the Rainbows to illustrate her own growth, thanks in part to the comprehensive records kept by a teammate. Moore Veldhoen experienced another freeing moment when she returned to the Yukon to see Pearl, who she had reconnected with through social media. She found a community that had healed itself and found a sense of forgiveness from Pearl. That trip helped Moore Veldhoen return to writing, at age 46. Moore Veldhoen wrote two books of literary fiction before penning her light-hearted memoir, which is the first book to get published. Hard copies of The View From Right Field are available from www.amazon.ca and electronic versions are available on Kobo and iTunes.